Vidyasaarathi & CARE Ratings invites Scholarship Scheme for PGDBM/MMS/MBA in Banking & Insurance 2018-19. 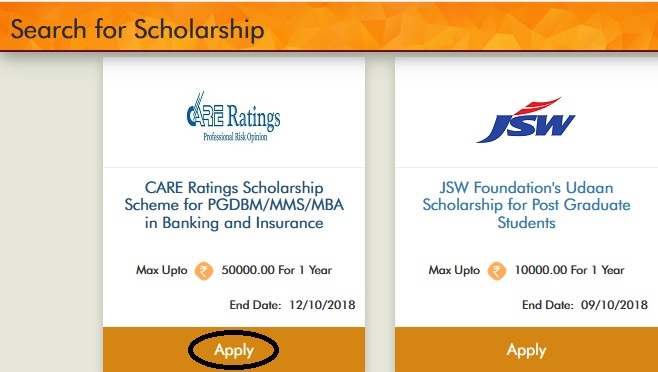 This Scholarship Program is only for students pursuing full time 2 years PGDBM/MBA/MMS with specialization in Banking and Insurance from the list of institutes preferred by CARE Ratings. Just follow the below steps to apply for the Vidyasaarathi CARE Ratings Scholarship Scheme 2018-19. Step 3 : After Login to your account Search for relevant schemes in which you are eligible and apply for scholarship. Hereby, I confirm that the funds provided towards my education by CARE Ratings under their CSR expenditure will be used for education purpose only. All the information provided above is true to the best of my knowledge. I am a D.EL.ED student. Can I get this scholarship?